Every winter while the snow piles up around me and the temperatures drops below zero, I daydream about running away to a tropical location. Give me beaches, warm air, ocean breezes. Sigh. Sounds wonderful, doesn’t it? Unfortunately, thanks to school and work, spending the winter where it’s warm is never an option. So, I just have to make do with what I have. I can’t experience the tropics in its entirety, but I can experience it bit by bit through my senses. Sometimes with my eyes, sometimes with my ears, and this time with my taste buds. This yummy Tropical Smoothie definitely tasted like I should be sitting at the beach with a warm breeze blowing through my hair. Good-bye winter, hello tropics! 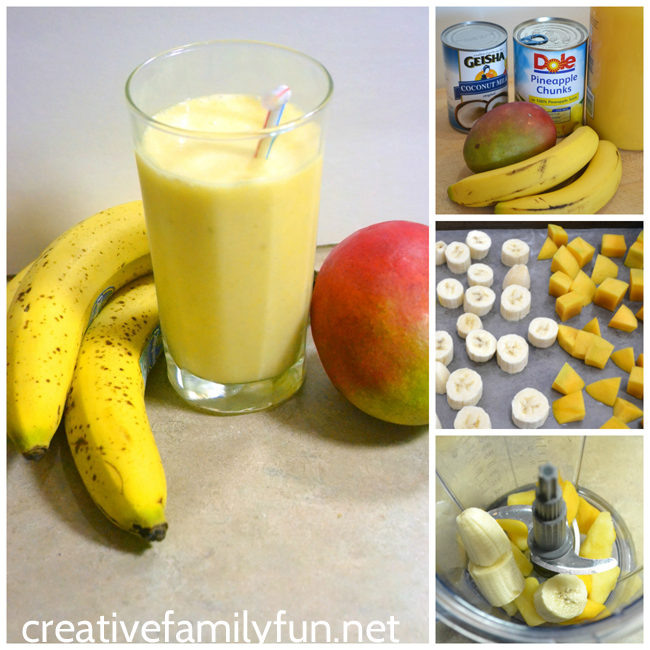 The idea for these smoothies started when we were working on our creations for Project:Around the World – The Bahamas. The cold winter outside was making the girls and I wish we could hop a plane. We read about the beaches, the weather, and the markets and we had music from The Bahamas playing in the background. If we closed our eyes, we could pretend we were there. We were only missing one thing – something cool and refreshing that tasted like a day in the sun. Since we were learning about The Bahamas, I wanted to make a smoothie inspired by all that we learned. 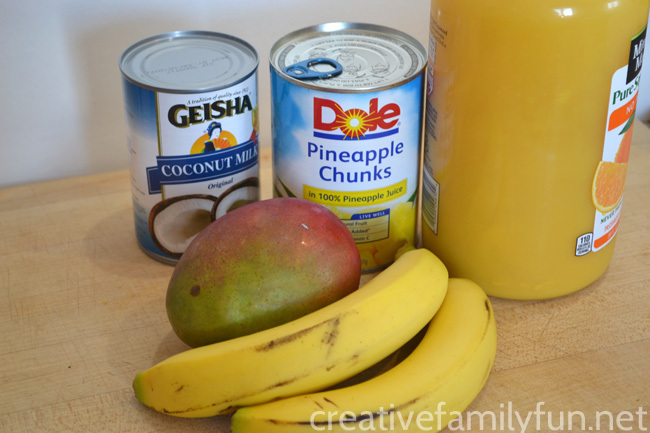 All the fruit that we used are grown in The Bahamas – pineapple, mango, bananas, and coconut (milk). We added a touch of orange juice, blended it together, and enjoyed our Tropical Smoothies. To make a good smoothie, you need some frozen ingredients. I cut up a mango, a banana, and opened a can of pineapple. I would have preferred a fresh pineapple, but you can’t always find good ones in Minnesota in the middle of winter. 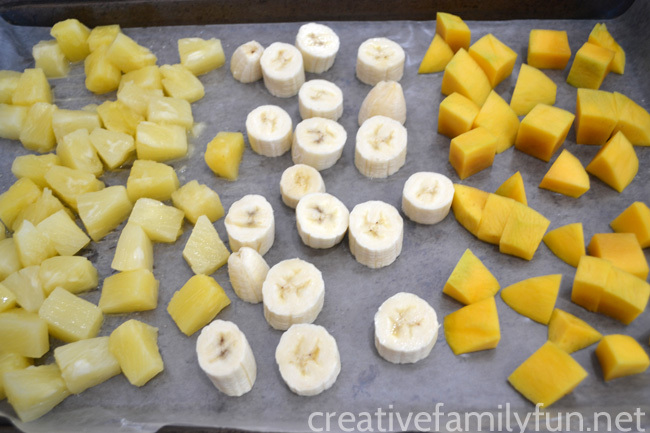 Then, I placed wax paper on a sheet pan, spread out the fruit and then popped it in the freezer for awhile. I froze way more than we needed for one smoothie. Once your fruit is frozen, you can pop it all in a plastic freezer bag so it takes up less room in your freezer. If you do want to make things easier on yourself, check the frozen fruit section of the grocery store. I was able to find a bag of frozen pineapple and mango chunks for our next round of smoothies. It’s time to make smoothies! Once you’ve got frozen fruit, it’s really easy to whip up a batch of tropical smoothies. Grab your blender (we have this one – it’s fab! ), throw in your ingredients, blend until smooth, and enjoy. Save this recipe. You’ll love it! Put all ingredients in the blender. Blend until smooth. Pour into glass and enjoy. 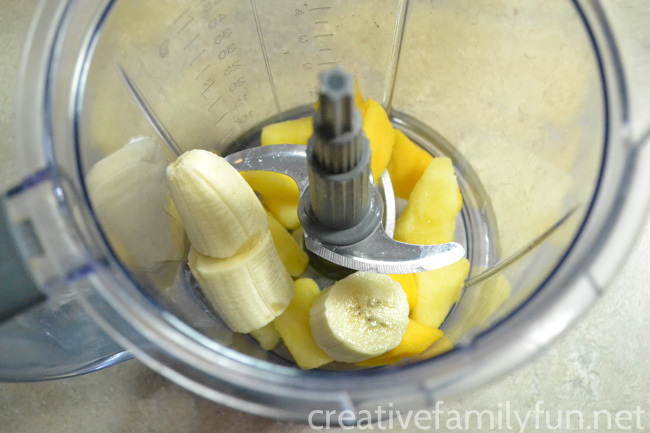 Note: I tried this smoothie using both frozen banana pieces and a banana straight from the fruit bowl. Either way works. If your banana is not frozen, you may need to add a couple of ice cubes before blending to get a good consistency. 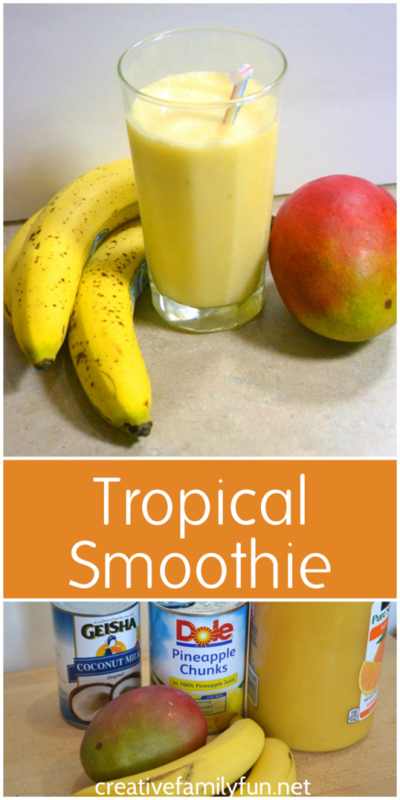 This yummy Tropical Smoothie definitely whisked us away from winter and onto a tropical beach. It would make a delicious breakfast or a healthy snack. So, the next time you want to experience the tropics, just blend up a Tropical Smoothie, grab a straw, sit back, and let your mind take you away to the beach.